New US documentary stamps began appearing in 1914, after the retirement of the Spanish American War era revenue stamp designs. 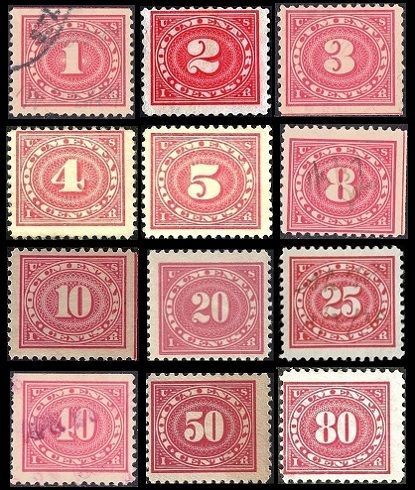 These new revenue stamps appeared during the period when many changes to stamp production methodologies were being tested. With that in mind, there are a number of paper and / or perforation varieties in the major designs illustrated on this page. The illustrations for each major issue type is shown only once. Any production varieties will be noted in the catalog detail tables following each group. 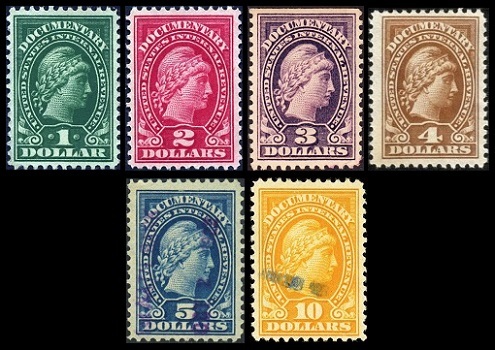 The eleven major documentary stamp types shown above were issued in 1914. The design of these stamps features a denomination numeral, and they are all inscribed "Series of 1914". 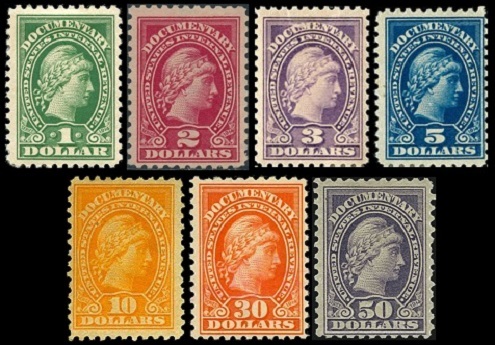 The catalog indicates that the issued color of these stamps was rose, however, as shown above, there are numerous different shades. 1/2 C. (1914 - Sc. #R195) - Rose. 01 C. (1914 - Sc. #R196) - Rose. 02 C. (1914 - Sc. #R197) - Rose. 03 C. (1914 - Sc. #R198) - Rose. 04 C. (1914 - Sc. #R199) - Rose. 05 C. (1914 - Sc. #R200) - Rose. 10 C. (1914 - Sc. #R201) - Rose. 25 C. (1914 - Sc. #R202) - Rose. 40 C. (1914 - Sc. #R203) - Rose. 50 C. (1914 - Sc. #R204) - Rose. 80 C. (1914 - Sc. #R205) - Rose. 1/2 C. (1914 - Sc. #R206) - Rose. 01 C. (1914 - Sc. #R207) - Rose. 02 C. (1914 - Sc. #R208) - Rose. 03 C. (1914 - Sc. #R209) - Rose. 04 C. (1914 - Sc. #R210) - Rose. 05 C. (1914 - Sc. #R211) - Rose. 10 C. (1914 - Sc. #R212) - Rose. 25 C. (1914 - Sc. #R213) - Rose. 40 C. (1914 - Sc. #R214) - Rose. 50 C. (1914 - Sc. #R215) - Rose. 80 C. (1914 - Sc. #R216) - Rose. 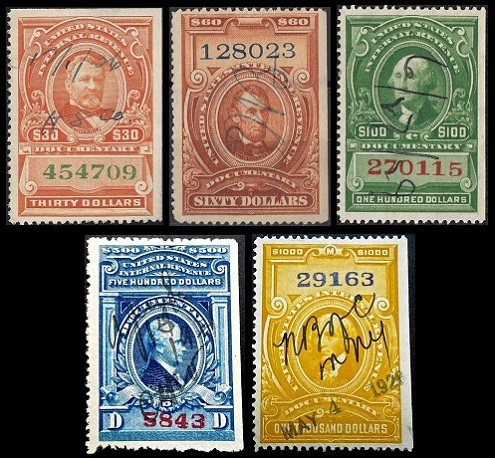 The seven major documentary stamp types shown above were issued in 1914. These stamps are all engraved, perforated 10, and they are all inscribed "Series of 1914". The design of these stamps features an allegorical representation of Liberty. 01 D. (1914 - Sc. #R217) - Green. 02 D. (1914 - Sc. #R218) - Carmine. 03 D. (1914 - Sc. #R219) - Purple. 05 D. (1914 - Sc. #R220) - Blue. 10 D. (1914 - Sc. #R221) - Orange. 30 D. (1914 - Sc. #R222) - Vermilion. 50 D. (1914 - Sc. #R223) - Violet. The four portrait documentary stamp types shown above were issued in 1914 and 1915. These stamps are all engraved, and perforated 12. The $60 denomination is inscribed "Series of 1915". The other denominations are inscribed "Series of 1914". These stamps were issued in vertical strips of four, which were imperforate on the top, bottom, and right side, thus all single stamps will have one or two straight edges. 0060 D. (1915 - Sc. #R225) - Brown - Abraham Lincoln. 0100 D. (1914 - Sc. #R226) - Green - George Washington. 0500 D. (1914 - Sc. #R227) - Blue - Alexander Hamilton. 1000 D. (1914 - Sc. #R228) - Orange - James Madison. The twelve horizontal-format documentary stamp types shown above were issued between 1917 and 1940. These stamps were all printed on Double Line USIR watermarked paper. The designs of these stamps feature denomination numerals. 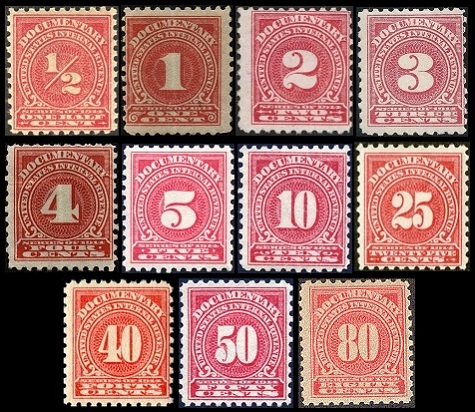 The catalog indicates that the issued color of these stamps was carmine rose, however, as shown above, there are numerous different shades. 01 C. (1917 - Sc. #R228) - Carmine Rose. 02 C. (1917 - Sc. #R229) - Carmine Rose. 03 C. (1917 - Sc. #R230) - Carmine Rose. 04 C. (1917 - Sc. #R231) - Carmine Rose. 05 C. (1917 - Sc. #R232) - Carmine Rose. 08 C. (1917 - Sc. #R233) - Carmine Rose. 10 C. (1917 - Sc. #R234) - Carmine Rose. 20 C. (1917 - Sc. #R235) - Carmine Rose. 25 C. (1917 - Sc. #R236) - Carmine Rose. 40 C. (1917 - Sc. #R237) - Carmine Rose. 50 C. (1917 - Sc. #R238) - Carmine Rose. 80 C. (1917 - Sc. #R239) - Carmine Rose. 01 C. (1928 - Sc. #R251) - Carmine Rose. 02 C. (1928 - Sc. #R252) - Carmine Rose. 04 C. (1928 - Sc. #R253) - Carmine Rose. 05 C. (1928 - Sc. #R254) - Carmine Rose. 10 C. (1928 - Sc. #R255) - Carmine Rose. 20 C. (1928 - Sc. #R256) - Carmine Rose. 02 C. (1930 - Sc. #R260) - Carmine Rose. 05 C. (1930 - Sc. #R261) - Carmine Rose. 10 C. (1929 - Sc. #R262) - Carmine Rose. 20 C. (1929 - Sc. #R263) - Carmine Rose. The six Liberty-type documentary stamps shown above were issued in between 1917 and 1933. These stamps DO NOT have an imprinted series date. 01 D. (1917 - Sc. #R240) - Yellow Green, Green. 02 D. (1917 - Sc. #R241) - Rose. 03 D. (1917 - Sc. #R242) - Violet. 04 D. (1933 - Sc. #R243) - Yellow Brown. 05 D. (1917 - Sc. #R244) - Dark Blue. 10 D. (1917 - Sc. #R245) - Orange. 01 D. (1928 - Sc. #R257) - Green. 02 D. (1928 - Sc. #R258) - Rose. 10 D. (1928 - Sc. #R259) - Orange. The five portrait-type documentary stamps shown above were issued in 1917. These stamps DO NOT have an imprinted series date. 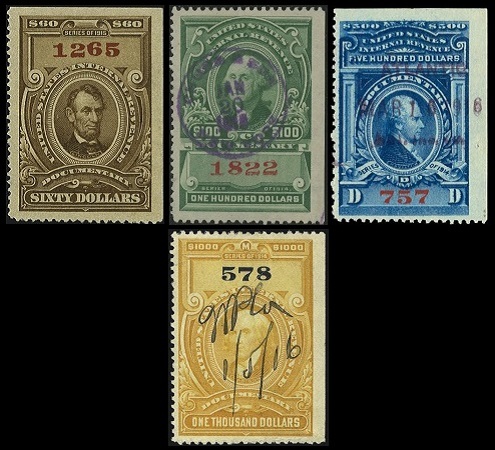 Some varieties have different colored serial numbers. 0030 D. (1917 - Sc. #R246) - Deep Orange - Ulysses S. Grant. 0060 D. (1917 - Sc. #R247) - Brown - Abraham Lincoln. 0100 D. (1917 - Sc. #R248) - Green - George Washington. 0500 D. (1917 - Sc. #R249) - Blue - Alexander Hamilton. 1000 D. (1917 - Sc. #R250) - Orange - James Madison. All of the major documentary stamp types of 1917 were overprinted "Series 1940" during 1940. 01 C. (1940 - Sc. #R264) - Rose Pink. 02 C. (1940 - Sc. #R265) - Rose Pink. 03 C. (1940 - Sc. #R266) - Rose Pink. 04 C. (1940 - Sc. #R267) - Rose Pink. 05 C. (1940 - Sc. #R268) - Rose Pink. 08 C. (1940 - Sc. #R269) - Rose Pink. 10 C. (1940 - Sc. #R270) - Rose Pink. 20 C. (1940 - Sc. #R271) - Rose Pink. 25 C. (1940 - Sc. #R272) - Rose Pink. 40 C. (1940 - Sc. #R273) - Rose Pink. 50 C. (1940 - Sc. #R274) - Rose Pink. 80 C. (1940 - Sc. #R275) - Rose Pink. 01 D. (1940 - Sc. #R276) - Green. 02 D. (1940 - Sc. #R277) - Rose. 03 D. (1940 - Sc. #R278) - Violet. 04 D. (1940 - Sc. #R279) - Yellow Brown. 05 D. (1940 - Sc. #R280) - Dark Blue. 10 D. (1940 - Sc. #R281) - Orange. 0030 D. (1940 - Sc. #R282) - Vermilion - Ulysses S. Grant. 0060 D. (1940 - Sc. #R283) - Brown - Abraham Lincoln. 0100 D. (1940 - Sc. #R284) - Green - George Washington. 0500 D. (1940 - Sc. #R285) - Blue - Alexander Hamilton. 1000 D. (1940 - Sc. #R286) - Orange - James Madison. The hand-stamps on a couple of these high denomination stamps come in different sizes.